Quinoa (Keen-wah, Kin-wah) are the small round seeds of a South American plant, eaten as a grain and popular as a health food. 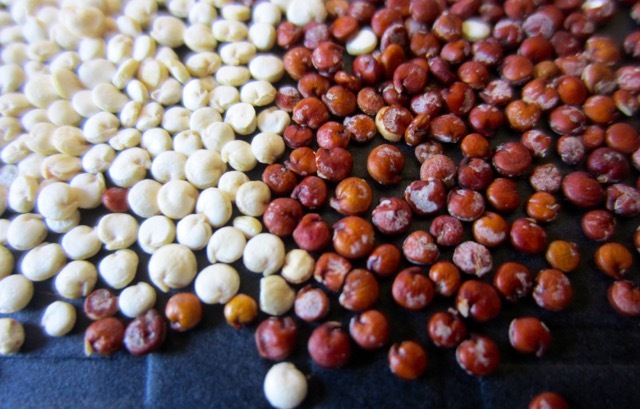 The seeds can be white, red or black in colour. Why is quinoa called a pseudo grain? Quinoa is not a true grain because it does not belong to the grass family (Poaceae/Gramineae), like maize (corn), wheat and rice. However it looks like a grain and has similar uses like a grain so it’s called a pseudo-grain. Buckwheat and amaranth are also pseudo grains. Quinoa originates in the Andean region of Bolivia, Peru, Equador, Chile and Colombia where it was domesticated 3-4,000 years ago for human consumption. It was the second most important crop of the Incas, after potato and was popularly referred to as the Mother Grain. Quinoa is currently grown for it’s edible seeds-like fruits. It is found in speciality stores or health food stores, but can also be found in supermarkets in corners reserved for healthfoods. It’s is more expensive than other grains because it has become increasingly popular in the USA, Canada, Europe, Australia, China and Japan, as a health food. The price of quinoa tripled between 2006-2013. The UN general assembly declared 2013 International year of Quinoa. Quionoa seeds come from a dicotyledonous annual plant, 1-2m high. It has alternate and broad hairy leaves. The stem is woody, green, red, or purple. The Flowers are small and green and occur in panicles, arising from leaf axils. 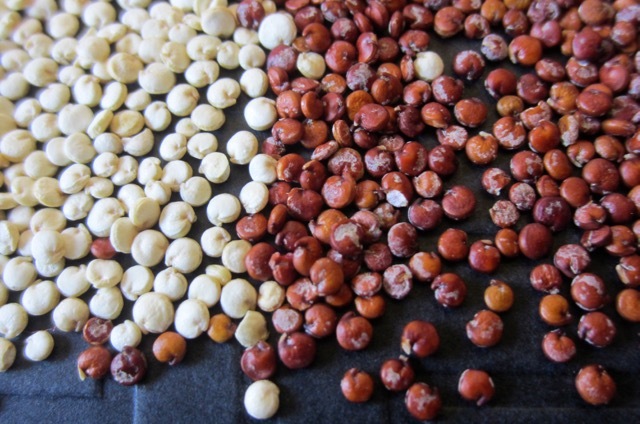 The seed-like fruits are small, white, red or black, and about 2 mm in diameter. They are the ones harvested as quinoa seeds. Quinoa thrives in poor soil, arid climates and mountainous altitudes. 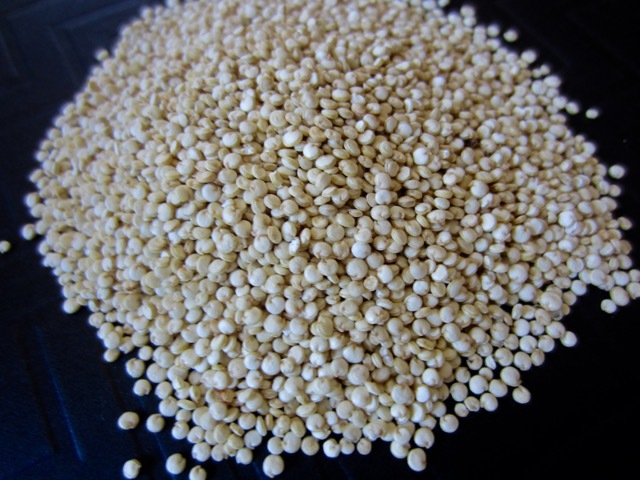 Quinoa grains have a natural coating of bitter tasting saponins that must be processed and removed before being consumed. 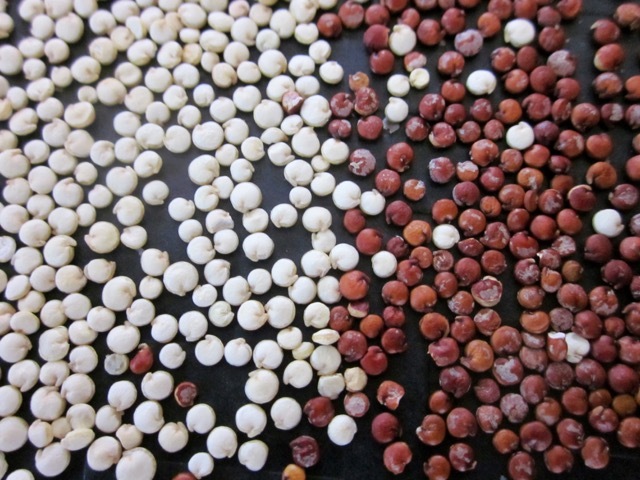 They are pale yellow, brown, red or black, about the same size as millet but flattened with a pointed oval shape. Cooked quinoa has a delicate taste and a light flavour, with a crunchy texture.The grains should be rinsed until the water runs clear to remove any powdery residue of saponins. They are generally cooked like rice. Use 1 cup liquid for 1/2 cup grain and cook for 15 minutes. This gives 2 cups cooked quinoa. Brown the grain for 5 minutes in oil before simmering or baking to give a delicious roasted flavour. The grains increase 3-4 times in volume during cooking and cook to a light fluffy and creamy texture. The external germ which forms a band round each grain, spirals out, forming a tiny crescent-shaped “tail” similar to a bean sprout. This “tail” is crunchy unlike the soft and creamy grain and this provides quinoa its unique texture. 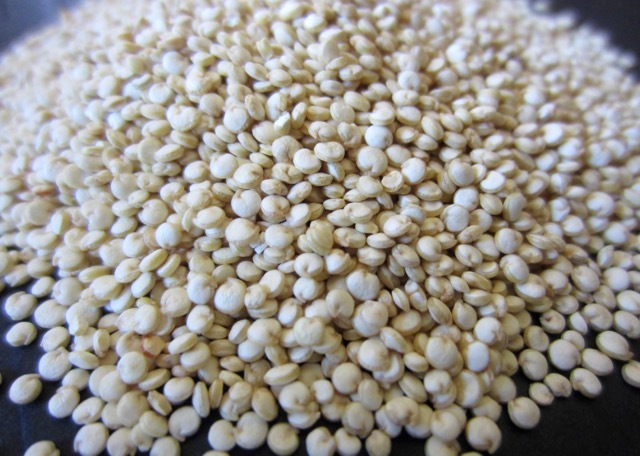 Quinoa has 14% proteins by weight, Buckwheat (18%) and Amaranth (12-17.5%). The protein content in quinoa is high compared to cereals like brown rice (2.5%), barley (12.4%) and millet (11%), but not as high as beans (24%) and other legumes, or oats (17%) and wild rice (15%). Several studies show that quinoa is a source of complete protein but contradicting studies argue protein source is not complete but it’s relatively high in essential amino acids. Quinoa is a rich source of B vitamins thiamine (31%), riboflavin (27%), vitamin B6 (38%) and folate (46%); vitamin E (16%) and dietary minerals, Iron (35%), Magnesium (55%), Potassium (12%) and Zinc (33%) of the RDA. It has a modest amount of calcium so is good for vegans who are lactose intolerant. It’s gluten free and considered easy to digest. Quinoa can be substituted for almost any grain, either as a side or main dish. It’s also popular in salads or breakfast recipes. Quinoa is used to make several products like: quinoa breakfast flakes or cereal, chocolate bars, quinoa whisky, quinoa chips and quinoa pasta just to mention a few. The young leaves of quinoa may be eaten as a vegetable like amaranth. The leaves should not be eaten excessively because high levels of oxalic acid are found in the leaves and stem of Quinoa, and other plants belonging to the genus Chenopodium. Quinoa, closely related Spinach and beetroots, was formerly placed in the family Chenopodiacee. It is currently placed in the family Amaranthaceae, (subfamily Chenopodioideae), according to the current APG system, based on molecular studies. 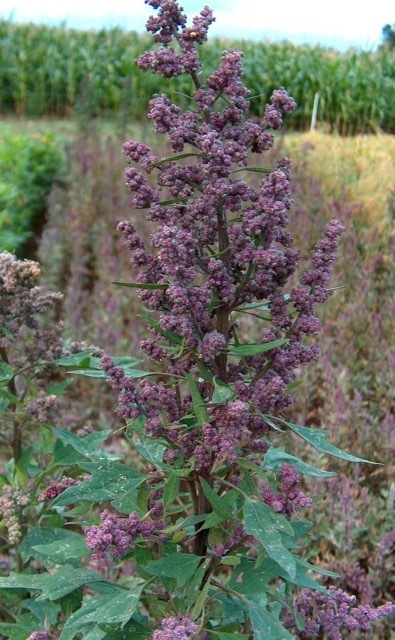 Quinoa closely resembles amaranth. Prev What is Clotted Cream? Next What is Green Garlic?